If you’re a fan of pumpkin seeds, you probably don’t need to be convinced that extracting them from their pulpy web is worth the effort. 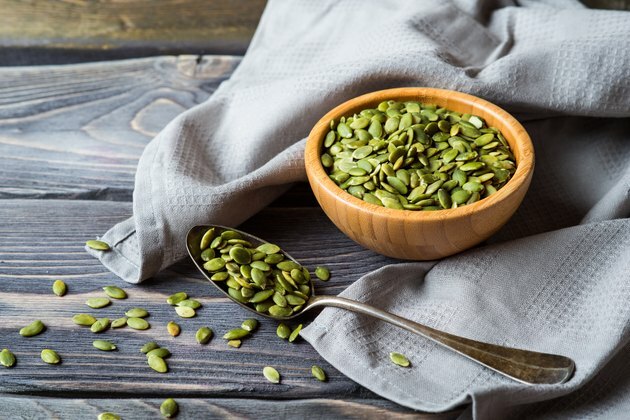 Including whole pumpkin seeds in your diet, chewy white shell and all, is an easy way to boost your intake of unsaturated fat, dietary fiber, zinc, iron, magnesium and vitamin E.
While pumpkin seeds can be eaten raw, they are often roasted before consumption. Pumpkin seeds also make a good addition to salads, granola and trail mix. Pumpkin seeds can also be blended into pumpkin seed butter. Although pumpkin seeds are undeniably healthy, they can be a source of undesirable side effects. The first thing you’ll notice when you pop a few pumpkin seeds into your mouth is just how chewy their shells are. Whole pumpkin seeds are an excellent source of insoluble fiber, the kind that promotes digestive efficiency and bowel regularity. Pumpkin seeds also contain calcium and iron. Despite these important benefits, whole seeds can be tough, stringy and difficult to chew thoroughly, which may lead to indigestion. Poorly chewed pumpkin seeds can irritate your esophagus as you swallow and eating too many may cause an otherwise unpleasant feeling of fullness. Eating pumpkin seeds can have some undesirable side effects. Eating too many pumpkin seeds, even when carefully chewed, can also lead to intestinal gas and diarrhea. Pumpkin seeds are high in fiber. You’ll get just over 5 grams from a 1-ounce serving of the whole variety, according to the U.S. Department of Agriculture, which means that some of their carbohydrates aren’t fully digestible. When these undigested carbohydrates reach your large intestines, they’re broken down by bacteria. Gas is a byproduct of this process, particularly for people who aren’t accustomed to fiber-rich foods. Eating more fiber than you’re used to can also lead to loose, watery stools. If you typically have diarrhea after eating pumpkin seeds, however, you may have a food intolerance or sensitivity. Constipation is also a possible, albeit less likely, side effect of eating pumpkin seeds — the fiber you get from eating large amounts of pumpkin seeds can also stop you up temporarily. Eating the seeds in moderation and with plenty of fluids can prevent digestive problems. One ounce is the standard amount for an individual serving. Pumpkin seeds have also been known to trigger migraine headaches in some people. If you’re not prone to migraines, however, you probably won’t develop one from eating pumpkin seeds. Although the unsaturated fatty acids in pumpkin seeds promote cardiovascular health, they also make the seeds prone to spoil quickly. Eating rancid pumpkin seeds exposes you to free radicals, toxic compounds that can increase your risk of cancer, heart disease and other chronic illnesses. Fresh, dry pumpkin seeds can stay in peak condition for about two months in an air-tight container in the refrigerator. Seeds that smell musty, oily or grassy have probably gone rancid. Medical News Today: What Are The Health Benefits of Pumpkin Seeds? Can I Eat Pumpkin Seed Shells? What Is the Nutritional Difference Between Hulled & Unhulled Sesame Seeds?